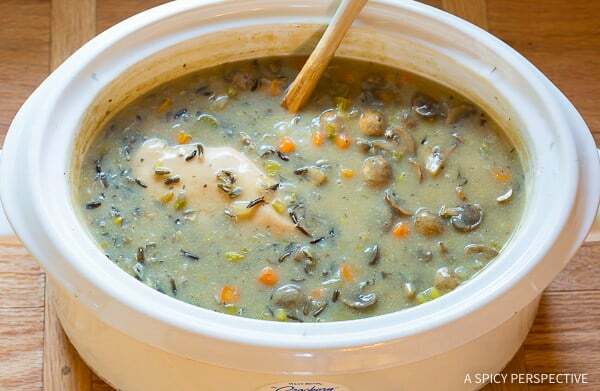 A hearty soup for healthy eating through the winter, Slow Cooker Chicken Wild Rice Soup! Still craving naughty holiday dishes, yet dead set on cleaning up your diet? January is always a needed, yet slightly unpleasant, jolt to my body and routine. 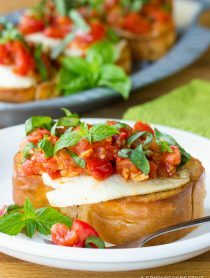 I’m trying to ease myself into healthy eating this year with warm filling dishes that make me feel like I’m enjoying classic comfort food. 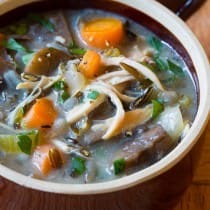 My simple Slow Cooker Chicken Wild Rice Soup is a stellar recipe for this sort of mental trickery. It’s rich and flavorful, loaded with veggies, rustic wild rice, and shredded chicken, and makes your tummy warm and happy! 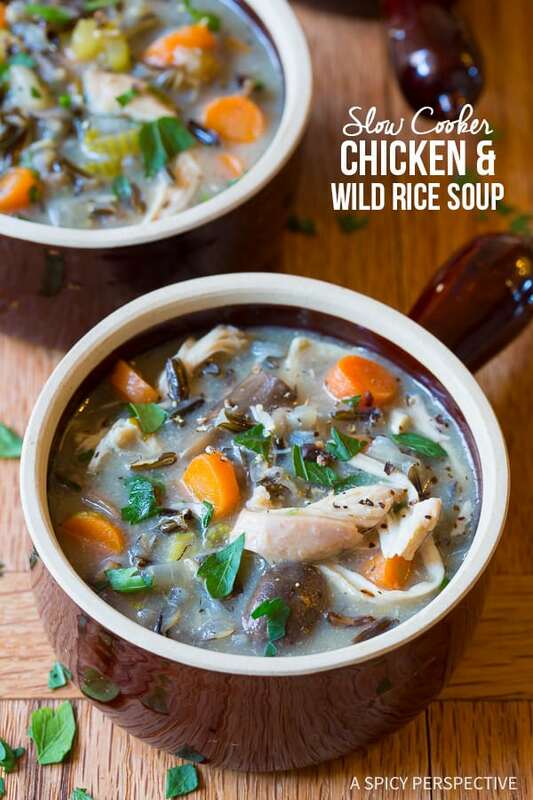 Not only that, Slow Cooker Chicken Wild Rice Soup is low in fat, dairy free, gluten free, and packed with vitamins and nutrients. Not too shabby for a rich hearty slow cooker meal! 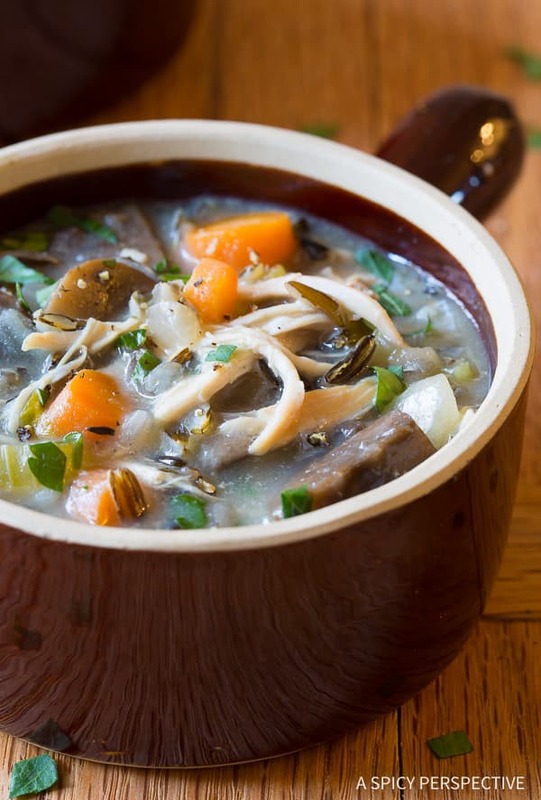 The key to making Healthy Slow Cooker Chicken Wild Rice Soup so appealing, is to add lots of herbs and veggies for flavor, and to not over cook the rice. All slow cookers are slightly different. The first time you make this, keep an eye on your settings, time, and the rice. Yours may take as little as 3 hours to cook through, but might take much longer. Adding a slurry of white wine and flour (or potato starch for gluten free) helps thicken the soup without additional fatty ingredients. If you would like to eliminate the wine (although it adds a lot of flavor) substitute extra chicken broth instead. 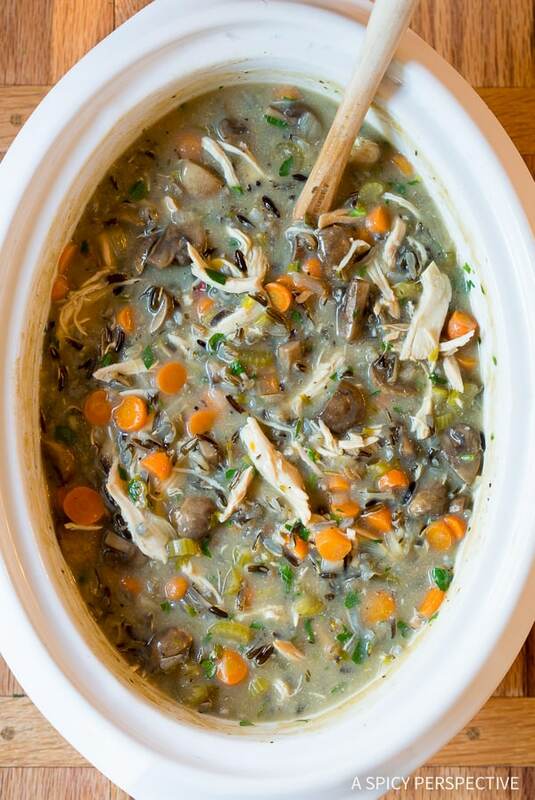 Our Healthy Slow Cooker Chicken Wild Rice Soup is keeping us on the straight and narrow this January. 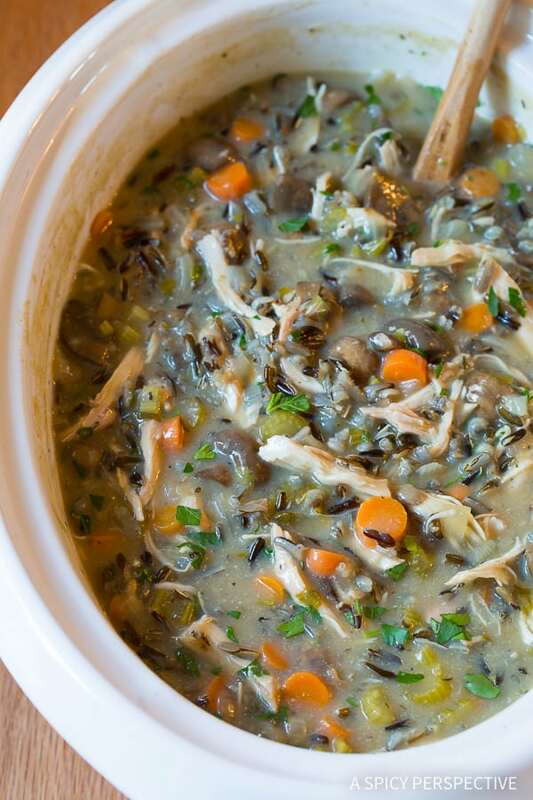 I promise, your family will love this Slow Cooker Chicken Wild Rice Soup recipe. In fact, I bet they won’t even notice it’s good for them. My kids gobbled it down two days in a row. 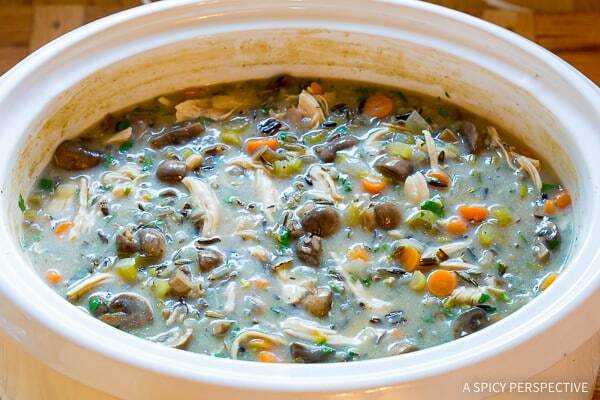 Healthy Slow Cooker Chicken Wild Rice Soup! Throw it in the crockpot and let it simmer until dinner time. A gluten free, dairy free, low fat option. Preheat a skillet to medium heat, and add the olive oil. Once hot, sauté the chopped onions, celery, carrots, and garlic to soften, 3-5 minutes. Then scoop them into the crock of a large slow cooker. Add the chicken breasts, mushrooms, thyme, wild rice, chicken broth, 1 tablespoon sea salt and 1 teaspoon ground pepper. Cover and set to high for 3-4 hours. 30-60 minutes before serving: Remove the cooked chicken breasts. Shred them with a fork and add the shredded meat back to the crock. Make a slurry by mixing the flour (or potato starch) with the white wine. Mix until smooth. Then stir into the soup. Stir in the parsley. Then cover and allow the soup to simmer until the base is thick. Serve warm! 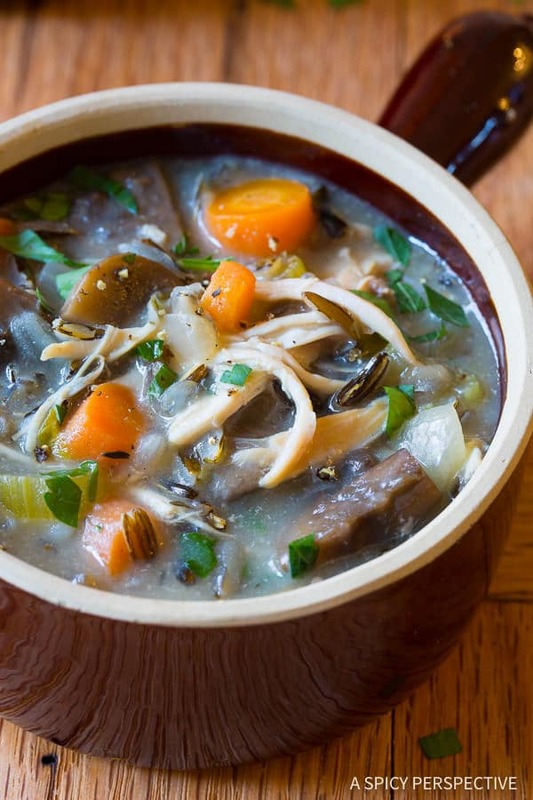 All-Day Cooking Instructions: If you plan on leaving your soup to simmer all day, follow the first two steps, omitting the wild rice. Set the slow cooker on low and let it simmer for 7-10 hours. Then once you return home, remove the chicken breasts. Add the wild rice and the flour-wine slurry immediately. Cover and turn the slow cooker on high. 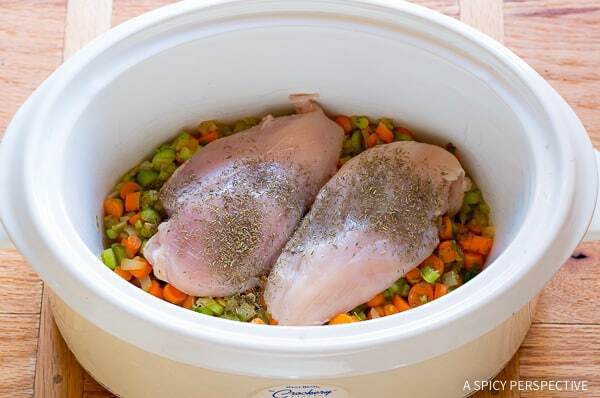 Shred the chicken breasts and add the meat and parsley to the slow cooker. 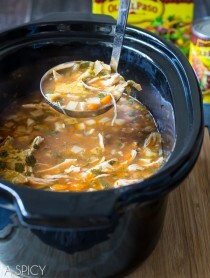 Allow the slow cooker to simmer until the rice has cooked through and the soup is thick, 60-90 minutes. Looking for More Healthy Dinner Options? Try These! Hi Sommer! We are gluten free, but I only have corn starch available at the moment. Do you have any suggestions on substituting it in for the potato starch? It should work just fine. Start with half the amount of potato starch and add more as needed. 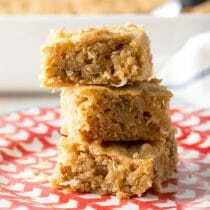 Delicious and easy; decreased salt amount to 1 tsp and pepper to 1/2 tsp. 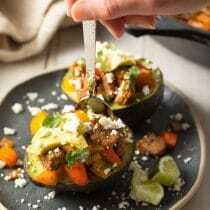 Hi!This recipe absolutely makes my mouth water,but I don’t have a slow cooker.Can this be done without the cooker?And if so,could you tell me how?I’m not very good with soups,hahaha. Hi Christine! Just cook it on the stove top, over low heat, with a heavy lid. You can saute the veggies in the same pot. The cook time on step 2 will be more like an hour. Thank you so much!I will probably try this out today or tomorrow.Can’t wait for it!Thank you so much again! 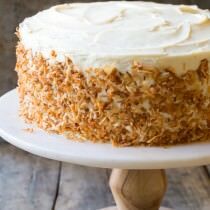 I’m making this right now. Can’t WAIT for dinnertime! Hearty AND healthy?! The perfect soup recipe!! There are few things more comforting than a bowl of chicken soup. It’s one of the few things I crave from my meat-eating days. I can smell its wonderful aroma through the screen! Oh YUM! looks delicious Sommer! 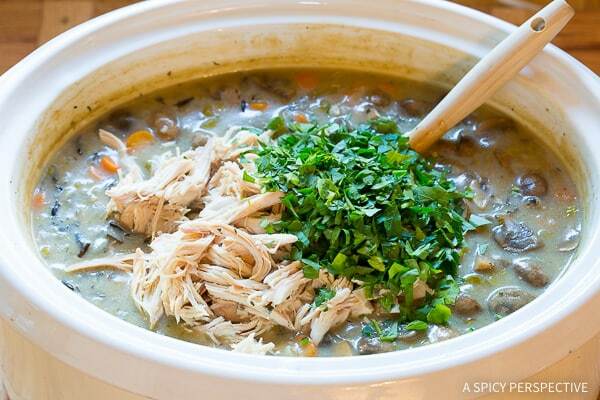 Love that you made this in the slow cooker! 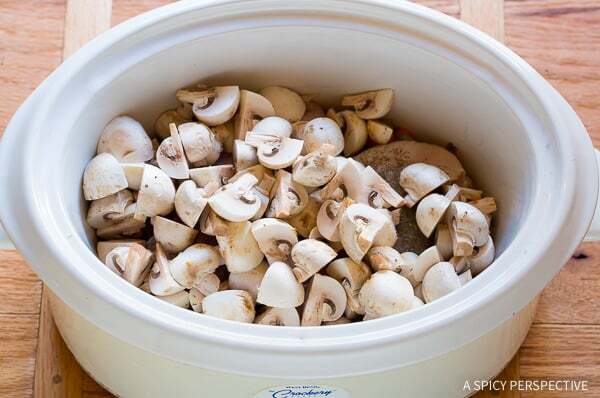 I love when the slow cooker can do all the work for me! 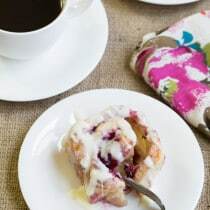 Sommer, this looks delicious! BUT I can’t handle mushrooms. What would you suggest as a substitute? Going to need a big bowl of this!! Ahh, this looks so warm and delicious!! 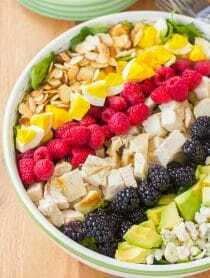 Looks perfectly healthy and delicious!! !